Some blue-green algae can produce toxins that can harm wildlife, pets and humans. These algae are found world-wide, including here in Missouri. In 2015, the Lakes of Missouri Volunteer Program began measuring the concentration of one algal toxin, microcystin, in some lakes. 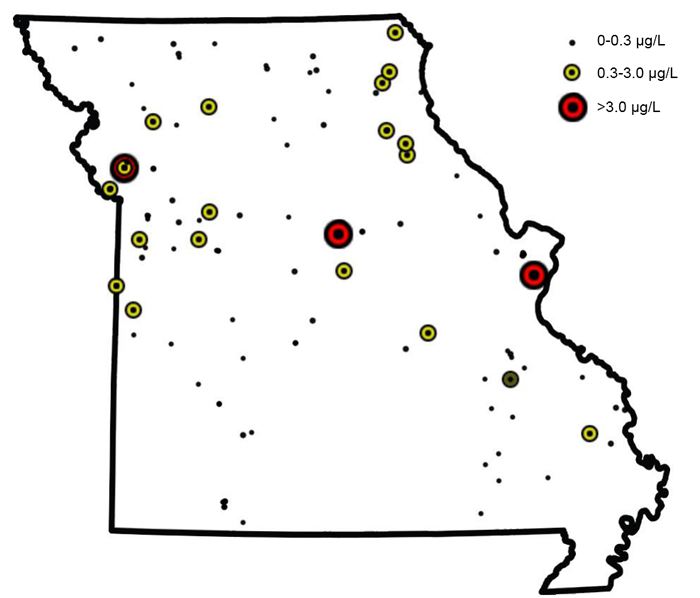 Our University of Missouri lake sampling program (SLAP) also collected samples in 2015 and the results show us the statewide distribution of this toxin for the summer of 2015. Currently, the State of Missouri does not have a formal response to high concentrations of microcystin, though plans are in the works. The State of Kansas established Public Health Watch and Warning levels of 4 and 20 ug/L, respectively. At the Watch level signs will be posted at beaches, marinas, boat ramps, etc. indicating that harmful algae are present and water may be unsafe for people and animals. At the Warning level, all contact with water should be restricted, including wading, water skiing, etc. Other states have similar responses to high concentrations of microcystin, with 20 ug/L being a common threshold for eliminating human contact with the lake. About 80% of the samples in 2015 collected had microcystin levels of 0.30 ug/L (parts-per-billion) or less. Only 3 lakes had concentrations greater than 3.0 ug/L The highest concentration of microcystin (approximately 10ug/L) was measured at a small quarry lake in St. Louis with no public access. Smithville Lake had a bloom in July, 2015 that resulted in Clay County Parks closing beach access for nearly a week. Our samples from that period show the microcystin concentration reached 8.7 ug/L on July 13. No samples collected in 2015 had concentrations greater than 20 ug/L. Results from studies conducted 2004-2006 showed results similar to those found in 2015. While Missouri doesn’t have the high concentrations found in some of our neighbors’ lakes, toxic blue-green algae are here, and we should continue monitoring. For the 2016 season, we have expanded this monitoring to more volunteers. This season around 40 volunteer-monitored sites and 75 MU Staff-monitored sites will be checked for the concentration of this algal toxin. Released by the Missouri Department of Conservation, this app will show fishing reports and prospects and the locations of boat ramps, fish attractors, fishing docks and bathrooms. Many of our state parks have fishing opportunities, whether those opportunities are on lakes or in streams. This app will help you find a park near you and point out amenities within the park. Lake Observer is part of a crowd-sourcing platform to facilitate the collection and sharing of lake and water related information across the globe. The Great Lakes Early Detection Network (GLEDN) created this app to help lake users identify and report invasive species on and around their lakes. This app features lots of pictures to help you identify invasive plants and animals.